This ranks number 1 on our list because they’ve got an all you can eat option! Breakfast tacos, homemade granola, pancakes, sandwiches, and eggs starting INR 380! They also have some super healthy Glory Bowls that will fill you up in minutes! Plus, you can pick from yummy options like Mexican Breakfast Bowl, Breakfast Hash, Grain Free Bowl and more starting INR 395! We recommend this place for salad lovers, there’s some great options! Vegans can have their pick as well. So there’s something for everyone! Are you the kind who likes a lot of options on your plate every morning? The Brew Room is perfect for you! They have breakfast platters which have a variety of food items that they start serving right from 8 am. There’s Something English (2 eggs any style, toast, bacon, sausage, parsley potatoes, baked beans, fresh juice) starting at INR 400. See how the food items took up one whole line? That’s what we love about this place! You can pick from Something Veggie, Something Fancy, and Something Local. Oh, and they’ve got all-day breakfast too (omlettes, eggs, ham, bagels)! This place is really something! If you fell for the twinkle lights and the vintage walls of Chamier’s Cafe, you obviously haven’t taken a look at their breakfast menu. Continental (with danish pastry! ), American, English Breakfast, they’ve got them all! And you can get a full-fledged brekkie starting INR 425. For those looking for healthy options, try their Antioxidant Powered Breakfast that has muesli topped with cinnamon and honey flavoured yogurt, a bowl of fresh fruits and berries, dry fruits and nuts, and a glass of fresh veggie juice! They also have omelettes, pancakes, waffles, and toast, so you can fill up on what you love! For those craving something different and unique on their brekkie plates, this place will not disappoint! Get blueberry pancakes, a stack of four classic pancakes, eggs, and more starting INR 225. They have griddle and gourmet pancakes as well! If you’re craving the unusual, order waffles! They have classic waffles, waffle and eggs, and more. We also recommend their savory waffles like Mediterranean waffle, cheese and barbecue waffle and more! Want a little bit of everything? Get the Waffle Brunch buffet on Sundays starting INR 425! For those who love continental breakfast, this cafe is your haven! All day breakfast includes bacon, sausage, eggs, toast, veggies, tofu, and so much more, the list keeps going! There’s also waffles (as fluffy as clouds), granola, sandwiches, and salads starting INR 385. Oh, and if you also want a view of rustic walls, chessboard floors, and lush green ivy to walk on, we recommend this cafe. A healthy breakfast made with fresh fruits and vegetables. Sounds delicious doesn't it? The Farm will make that happen for you. They have granola and ragi porridge starting INR 200. Healthy healthy! Try their freshly baked Artisan Breads starting INR 150. Munch on their super fresh fruit bowls, they have literally been picked from trees and put into your bowls! Cheese lovers, enjoy their Little Cheese Plates starting INR 300 and cheese up your senses. They’ve got plain cheese like ricotta and caprese and cheese-based delicacies! Oh, and they’ve got eggs, muffins and pancakes too. You’ve probably heard about the Victorian vibes and Enid Blyton feels, but have you heard about their brekkie yet? They’ve got French toast, eggs, and sandwiches starting INR 250! They have a bunch of yum salads too, with quinoa, chickpea, fruits, and more! Pair your brekkie with one of their organic teas. We loved the Berry Blush tea! Oh, and we recommend their English Breakfast. Which other place can be more English than The English Tearoom itself? 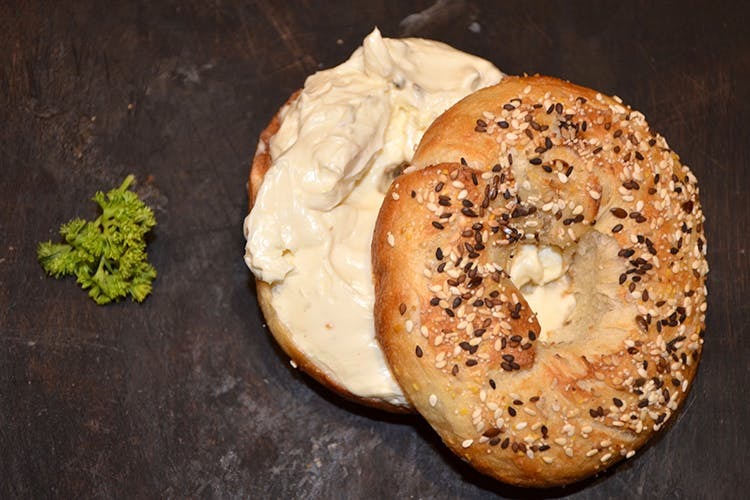 How does a bagel brekkie sound? Well, this place has seven kinds of bagels and more than 15 kinds of schemers to choose from. Phew! There’s olive tepenade, spiced peanut butter, and so many more interesting flavours starting INR 120! You can bite down on a sandwich or melt too, they are yum! And, this place is super pocket-friendly! They have a Friendship Month offer going on right now too, so get your mini bagel + cold drink for INR 79! Check this out if you want to know what we thought! Anna Nagar peeps, go to this place for some interesting all-day breakfast options! You can try the classic, but delish Pierogi Breakfast Platter (hash browns, baked beans, toast, and more) for INR 190. There’s a bunch of other options too like pancakes, sausage, cheese steak omelette platter, and sandwich melts starting INR 130! Oh, and they’re all super budget-friendly! Want a brekkie with the view of the beach? Head over to Surf Turf at Kovalam! Chill right by the waves and enjoy a Madras Breakfast (eggs, chicken sausage, grilled tomatoes, juice, and more) or a Classic Breakfast with eggs and everything starting INR 150! If you want a light breakfast, get a toast, vadai, or bacon starting INR 80. This place doesn’t have too many options, so it’s easy to choose. Also, you’ve got the blue sky, the blue horizon, and piping hot brekkie? Did we just plan your Sunday morning?